The Arduino 101 will go on sale in the first quarter for $30. School kids and hardware enthusiasts who want to start tinkering with Intel’s tiny Curie chip will be able to get their hands on it early next year in the form of an Arduino development board. Curie is a new chip module that Intel showed at the International CES in January. About a centimeter across, it includes a 32-bit microcontroller, Bluetooth Low Energy for connectivity, a small amount of RAM and Flash, and a six-axis sensor with a gyrometer and accelerometer. The chip is built for wearable devices like a smart pendant or smart bracelet, but it could go into just about any small gadget that doesn’t need a lot of local processing power, such as a remote-controlled car. Arduino’s Curie board will be marketed as Arduino 101 in the U.S. and as Genuino 101 overseas, in line with how Arduino brands its other products. It will be priced at US$30, or about 27 euros, and go on sale in the first quarter next year. The board isn’t really small enough to build a decent wearable—it’s 7cm long and 5.5cm wide—but it’s OK for prototypes and getting familiar with Curie’s capabilities. 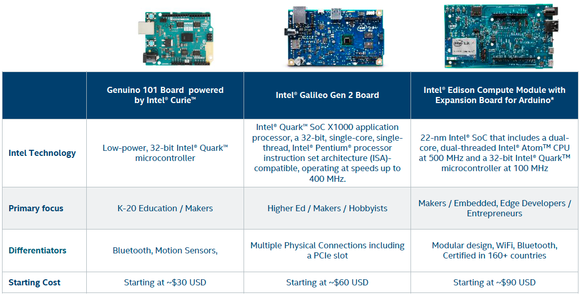 Intel or its partners are expected to offer smaller Curie boards in the future. The board is aimed partly at schools, where it can be used in the classroom to get kids interested in programming and electronics. But it’s also aimed at the maker community, which has been using Arduino boards to build all kinds of products. Intel has been courting the maker community hard. It’s announcing Arduino 101 at the Maker Faire in Rome on Friday, where Intel is a sponsor, and the board will be featured on an upcoming reality TV show, America’s Greatest Makers. Having missed out on the smartphone market, and with PC sales in decline, Intel wants to make sure it doesn’t miss the next wave in computing, which might turn out to be be wearables. It hopes the maker community will produce a hit product based on one of its chips. It already offers a couple of Arduino boards, Edison and Galileo, but they’re more expensive and require more skill to program because they run the Linux OS. He said Arduino 101 is comparable to the Arduino Uno, which is based on a microcontroller from Atmel, except the Curie board includes Bluetooth and the six-axis sensor. Arduino’s founders have started a program for schools called Creative Technologies in the Classroom, which provides kits that include hardware and teaching materials for use in the classroom. Arduino 101 will be included in those kits, Melican said, helping Intel get its technology in the hands of budding engineers at a young age. Like other Arduino boards, it can be programmed and charged up by plugging it into a PC via the USB port. It can be programmed using the Arduino developer tools. Intel also plans to send Curie developer boards to its device manufacturing partners, but it’s not talking about those yet. And it’s developing some software kits, called Intel IQ, specifically for wearable devices, but they’re not available yet either. If it wants to catch the next wave of computing, it had better get a move on.